And beseech thee. Succeed Lord Gwyn, and inheriteth the Fire of our world. Thou shall endeth this eternal twilight, and avert further Undead sacrifices." —The illusion of Gwynevere, revealing the chosen Undead's destiny to succeed her father, Lord Gwyn. "Lord Gwyn trembled at the Dark. Lord Gwyn resisted the course of nature. Gwyn has blurred your past, to prevent the birth of the Dark Lord." —Darkstalker Kaathe, giving an alternative, darker account of Lord Gwyn to the chosen Undead. Gwyn, Lord of Cinder is a character and final boss of Dark Souls. He was a great warrior and God, once known as the Lord of Sunlight, who ended the Age of Ancients when he fought the dragons along with Gravelord Nito, the witch of Izalith, Seath The Scaleless, The Furtive Pygmy, and his faithful knights. For disputed reasons, he sacrificed himself to link the First Flame at least one thousand years before the events of the game, and thus began the Age of Fire. Gwyn was so powerful that he bequeathed parts of his soul to the Four Kings and Seath the Scaleless prior to this, and still his soul remains "a powerful thing indeed". He was succeeded by his children: his firstborn; the banished God of War who lost his status as a deity, his daughter Gwynevere; the Queen of Sunlight, and his lastborn Gwyndolin; his "repulsive [and] frail" son who Gwyn raised as a daughter due to his affinity for the moon. It will come as no surprise to anyone who has spoken to Kingseeker Frampt, Darkstalker Kaathe, or the illusion of Gwynevere, that Lord Gwyn is the final boss of the game, and that it is the chosen Undead's goal to either succeed him and end further Undead sacrifices, or start the Age of Dark: the apparent age of humanity. 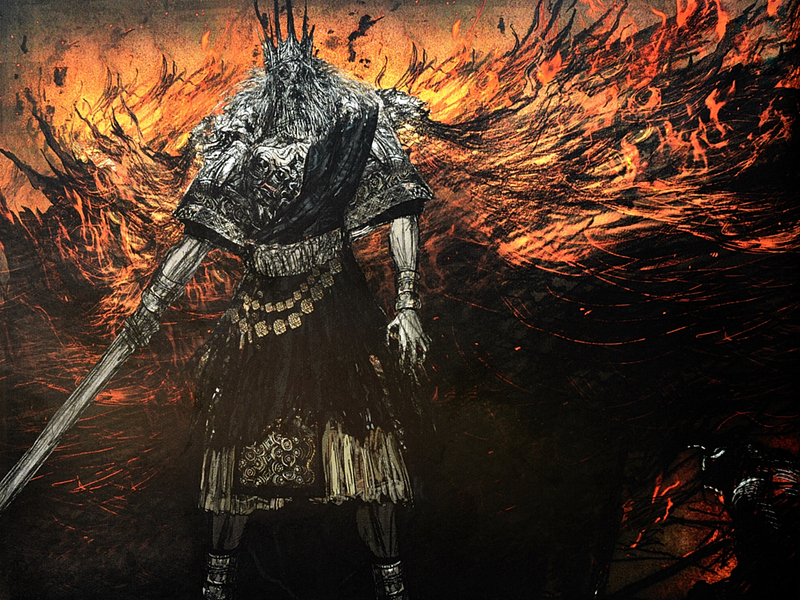 He can be fought after acquiring all Lord Souls and Lord Soul Shards and returning them to the Lordvessel at Firelink Altar, which will grant access to the Kiln of the First Flame. After fighting past five of his Black Knights, a Hollowed and haggard Gwyn awaits the chosen Undead at the site of the First Flame, presenting himself as their final challenge. If you get too far away he’ll perform a high speed dive attack; this will do massive damage and will be hard to dodge and harder to block. You can parry the attack, but the timing window is extremely small, so it's much safer to dodge the attack instead of taking damage from him. He has a pattern, but it isn’t stable. He reacts to what you do, quickly, and possibly more so than any other enemy in this game. He can easily dodge your attacks when not currently in an attack animation. The room is circular but there are many obstacles in the room; put them between you and him for a few precious seconds of breathing room. Learn his repertoire; you can beat most bosses without knowing their every tell, but not so here. He’s too fast for that, so you need know what he’s going to do. 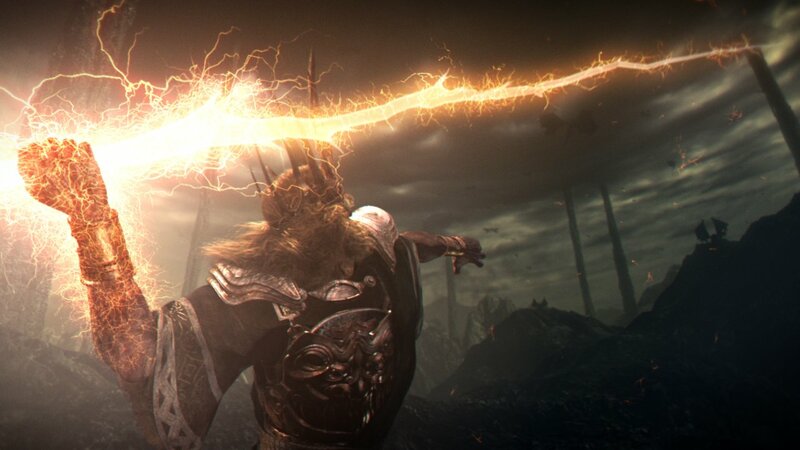 Do not use lightning-based weapons; Gwyn has an incredible resistance to them and will almost half the player's damage output. Gwyn is also extremely resistant to Faith-based offensive miracles, such as Lightning Spear and Sunlight Spear, practically nullifying their usefulness. Gwyn has many different attacks, mostly involving a non-stop barrage of sword swings which will take down your shield and stamina quickly. Some attacks to watch out for would be his Grab which he will fireblast you into the air for moderate damage and a dashing strike which will do heavy damage if not blocked or dodged. Also a fairly easy strategy is to hide behind one of the large rocks near the center of the room so he hits the rock rather than you; when he goes for a grab and misses go in for a hit and back off. You can also hit him after he finishes his 3-4 hit combo. The standard strategy is to keep Gwyn far enough away so he misses his attacks made against you and with a combination of rolling and quick attacks and backing off, you can slowly whittle away his health and beat him. A very easy way to defeat him is to equip a few powerful fire spells and stay close enough for him to try and grab you so that when he reaches and misses just blast him with your fire. Also works when he kicks but his recovery is a bit faster so there is more of a risk of sustaining damage. For casters: Use Homing Soulmass or Homing Crystal Soulmass when you have put enough distance between you and the boss to do so (put too much space and he‘ll dive bomb you), then rush him with your shield up so that when your Soulmasses launch he’ll be too busy attacking you to dodge. Do this three to six times (depending on Intelligence) and he’s done. In fact, this strategy works very well even without a shield. Lord Gywn is very good at dodging Soul Spears and Soul Arrows, but he is terrible at dodging Soulmasses. He will try to dodge spells when you cast them by sidestepping without taking into account the slight delay before Soulmass spells go off. By dodging his attacks and repeatedly casting a Homing Soulmass type spell Lord Gywn can be killed very easily. Gwyn can be defeated relatively easily using Havel's Greatshield (or any high stability/fire resist shield) and a spear type weapon. Simply move directly towards the rock to your immediate left upon entering the battle. Continuously sidestep and hug the rock to keep it between you and Gwyn. He will try to attack you and grab you through the rock and while he does this you can hold down block while poking him through the rock with your spear until he dies. For those looking for a safer defensive strategy: Equip your best heavy armor such as Smough's Set or Havel's Set along with the Havel's Ring. The ring is crucial to be able to back away quick enough to dodge his kick or grab attacks. Next, equip a leveled Black Iron Greatshield. I used a +12 here. The higher the better. This will negate the fire damage from his attacks and absorb the majority of his strikes with ease. Use a leveled Lightning Greatsword. I used a +5 Lightning Zweihander. This will stun him and give you time to back away and let your stamina replenish. The key with the strategy here is to stay close enough to him that he doesn't do his dive bomb but far away enough to still be able to back away from his grab attack. So just barely out of his swords reach whenever possible, but it's good to vary your distance to try to lure him into going for the grab or kick. As soon as you see him start to lean in with his shoulder start to back away. After he misses the grab or kick go in for a hard R2 strike. In order for this to work you must keep an eye on your stamina bar at all times and drop your shield after each attack chain to let stamina recharge. Do not yourself get below 50% at any time if possible. Repeat this and in no time he'll be gone. Another thing that works well is to keep moving and circling him with shield up in either a clockwise or counter-clockwise direction. When he does his 3-4 strike attack you can generally dodge all swings by moving momentarily to the left, right, left as he swings each way saving you precious stamina. There's no need to roll with this strategy but it can be done if you get caught without enough stamina to block and need to get away to recover. You will need a reasonable high SL for this strategy. Minimum strength and stamina in the mid 30's. Another method for casters (or anyone requiring some more room to heal, etc.) is to make use of the very large rock formation to the left of the room (facing inwards from the fog gate). There is a large rock that can be used to create a (very) large amount of breathing room and the only issue when using this strategy is leading Gwyn to the spot. It's best to start out in the middle, and then roll backwards until you reach the wall slightly behind the rock and then roll to the right, throwing yourself over the small uprising between the wall and the edge of the rock. This method will generally stop Gwyn's onslaught for a fair while as he fails one or even two non-jumping attacks, giving you an immensely gratifying break to heal up or load a soul mass. Beware though, this reprieve is only temporary and his jumping attack can clear the obstacle easily if you move far enough away from him to trigger it. If you have the Iron Flesh pyromancy purchased from Laurentius and a good heavy damage weapon, you can take Gwyn within a minute or two. When you enter the fog gate walk a few steps forward and use Iron Flesh, raise your shield and wait for him to come. When you defend his jump attack, get double-handed weapon and don't stop attacking him; with a +5 Black Knight Greataxe at every 2 hits him will get stunned for a while and stop attacking, when this happens go to the back of gwyn and continue attacking until he dies. Wear your strongest physical damage reduction armor and the Flame Stoneplate Ring before entering the fog gate. Just be careful when Iron Flesh effect ends ! You can equip a Black knight shield +5 which has 74 stability and a 95% Fire damage block. Tank his hits until he does his grab move which leaves him vulnerable for several seconds. The Black Knight Sword +5 can stagger him every second two-handed hit. If you have a decent amount of stamina, simply beat on him until you are almost out. Stop attacking after the last staggering hit you can hit him with. If the last hit does not stagger him, he will have recovered by the time you will be able to get your shield out. If Solaire of Astora survived the 'Izalith incident', then he can be summoned at the top of the last staircase. Use him to draw Gwyn's attention. To make him survive, concentrate more on protecting Solaire than fighting Gwyn. As the Kiln area remains popular for high level PvP, It is easy to summon players to assist with the battle should you choose. The most common location for summoning signs is on the platform at the base of the long staircase leading down from the lordvessel, but signs may also be found scattered throughout the level and before Gwyn's boss fog gate. Given the high rate of invasions in the area, be prepared to sprint for the boss gate as soon as your summon(s) arrive. Upon defeating Gwyn, you have two choices. 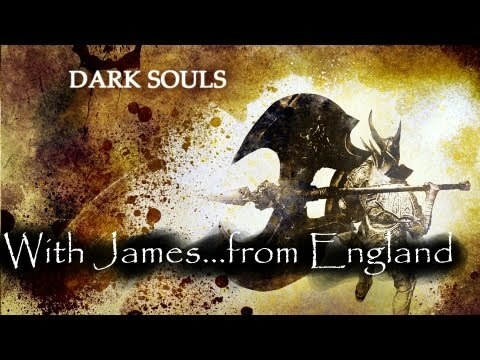 Exiting through the doorway, after defeating Gwyn, will give you the 'Dark Lord' ending. If you light the Bonfire you get the 'Link the Fire' ending. In either case, you will then immediately go into New Game Plus, so make sure you have done everything else you wish to do in your current playthrough before you decide to defeat Gwyn.